Show that you care about our precious waterways and remind others to do the same. Bazza the Bunyip is not a myth. He lives in the Murray River. A water creature by heart, and a conservationist by nature, Bazza is naturally concerned about his environment. 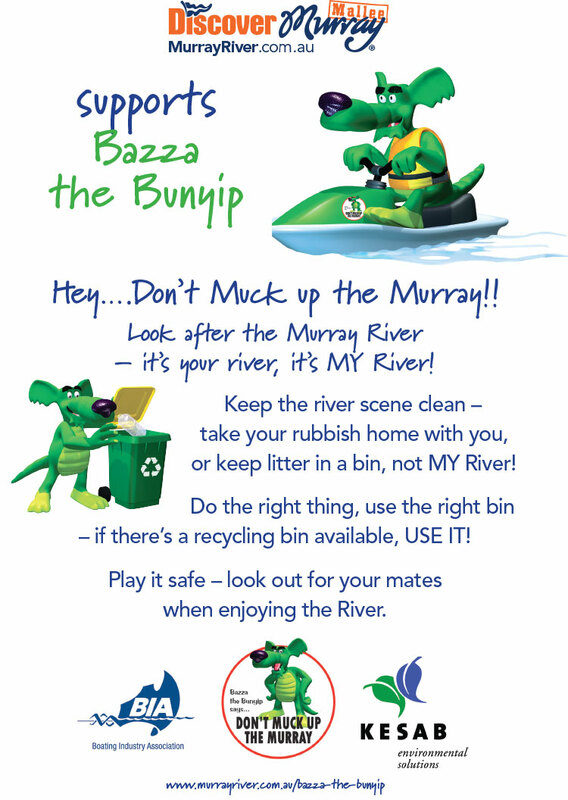 Bazza wants everyone to do the right thing by the river, so he is friendly and constructive in his advice to people who are prepared to protect the Murray. However, he can also be a little harsh and stroppy with those who won’t do the right thing. He has been known to emerge from the river or nearby vegetation with angry growls, warning offenders and even threatening to rip out their tent pegs, or stove in the sides of their boats. So look out if not doing the right thing! Bazza has a sense of humour, coupled with a strong sense of fair play. He is the protector of the river against pollution, damage to native plants and animals and impacts of boats on people’s enjoyment whilst on the river. Bazza also loves the peace and quiet of the river and he’ll go out of his way to help people care for the Murray River environment. In the past, Bazza became a conservation hero, an environmental ambassador with children and adults alike. His voice was heard on radio stations giving friendly advice on how to do the right thing by the Murray River. 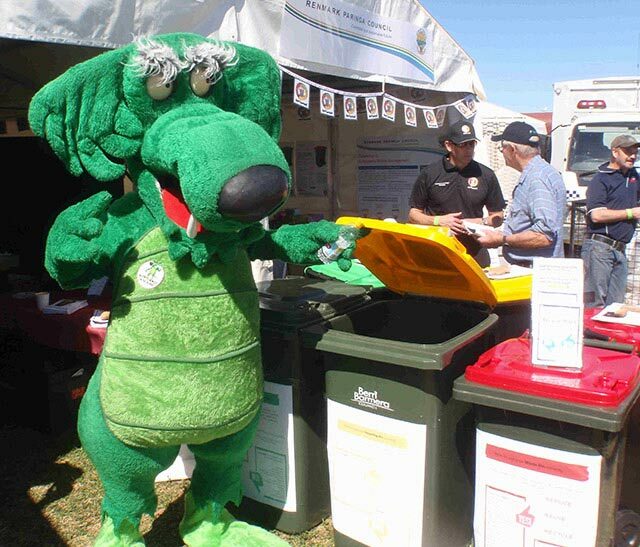 Well Bazza’s back and over the coming months Bazza will again, subject to funding, be joining with community groups, schools and local businesses along the river to promote his worthy cause of looking after the Murray River. 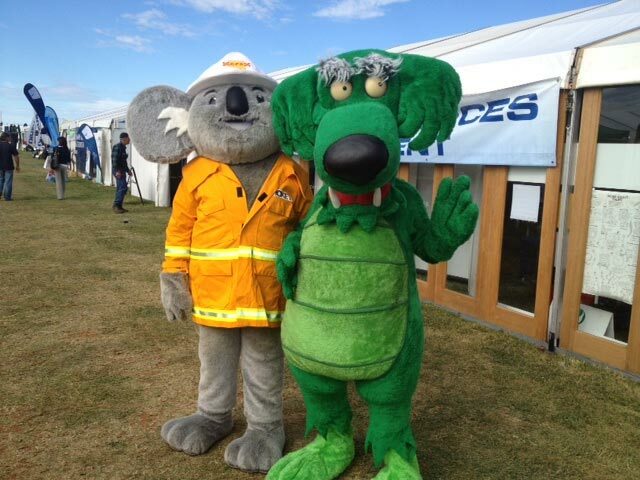 Look out for him - he’s unique in Australia as an environmental hero, in fact as an endangered species. The community is being urged to get behind Bazza to protect his environment, our environment, and improve the quality of the river and their own experiences whilst on the Murray River. More focus on water issues and greater community awareness of the environment. Issues have changed over the past 20 years, particularly associated with water. Other issues include grazing, riverbank destruction, particularly wake from high energy craft, greywater deposits from houseboats and general natural resource management impacts. There is a need to remind the community of behavioural issues associated with ‘doing the right thing’ by the river environment. Sustainable tourism approaches can be reinforced in order to bring back visitors to the region and whilst there ensure the environment is protected and enhanced. Issues have changed and one of the reasons that Bazza is being brought back to assist with raising community awareness and educating river users. Greater industry focus and education by EPA. Closed pipe systems have replaced open drains therefore minimising evaporation. Alternatives and solutions introduced to minimise erosion of riverbanks. EPA code of practice introduced for vessel and facilities management. Drought response and recovery programs initiated. Full time staff allocated to tasks associated with industry and recreation issues in the region. Industry awards introduced recognising environmental best practice.